E-Alternative Solutions is targeting vapor’s next frontier—the nicotine salt-based products that vapers (and the FDA) are buzzing about. 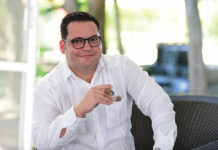 In a category characterized by constant innovation, it can be hard to keep up with the latest “next big thing.” After all, plenty of hot new products have come and gone in the years since vaping itself became “a thing.” That said, all the signs point to the most recent inventive category—nicotine salt-based vapor products—possessing staying power. Fans of nicotine salt-based products say that they more closely replicate the experience of smoking combustible cigarettes, making them a more effective option for those who are addicted to nicotine but seeking to transition toward what they view as a less harmful product. This is partly because with traditional e-liquid, it’s difficult to vape a higher concentration of nicotine without getting too powerful of a “throat hit,” or feeling in the back of the throat. This makes it tough for former smokers to comfortably replicate the nicotine buzz they get from puffing on a conventional cigarette. Nicotine salt-based products, on the other hand, can offer a more satisfying experience. Yet the category’s most prominent manufacturer, Juul Labs, is also arguably the most beleaguered. The company has become the target of lawsuits by anti-tobacco activists who claim it intentionally marketed its Juul device to minors. Meanwhile, youth vapers charge that the company led them unwittingly into nicotine addiction. As a result, Juul Labs is now busy backpedaling its once-aggressive marketing efforts, pledging to spend $30 million on underage tobacco use prevention. The net effect? Products containing nicotine salts remain in high demand, even as the top-selling brand is in a vulnerable place both politically and from a marketing standpoint. Given these twin factors, it’s not surprising that other vapor manufacturers have spotted the potential upside of getting in on the nicotine salt-based product trend by adding a Juul-like alternative to their repertoire. The nicotine salt-based vapor system Leap, which was recently unveiled by E-Alternative Solutions (EAS), is one of these. In the same vein, EAS sought to focus on a product that offered maximal flexibility, both in terms of usability and nicotine strength levels. 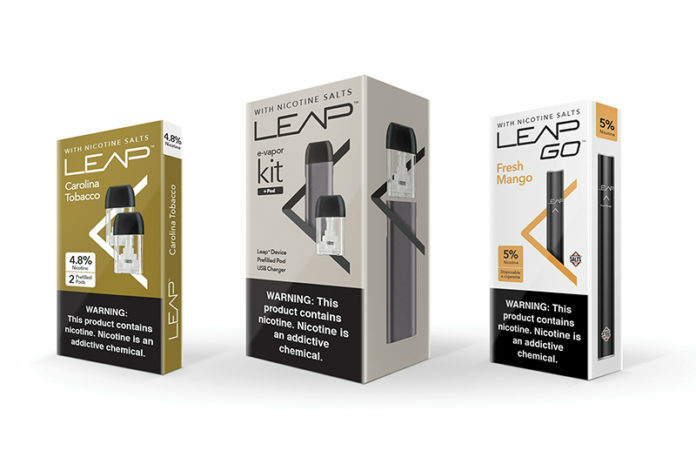 The company’s Leap Vapor with Nicotine Salts franchise includes both rechargeable and disposable models—and each e-liquid flavor comes in three nicotine levels. “We thought it was extremely important to provide adults flexibility and not to lock them into a given nicotine strength,” says D’Alessandris. Priced at $7.99, the disposable Leap Go device comes in six flavors—Smooth Tobacco, Citrus Menthol, Cool Mint, Georgia Peach, Mixed Berry and Fresh Mango—each of which is available in three nicotine strengths (5 percent, 3 percent and 0 percent). The Leap rechargeable system kit containing one 1.5 mL pod is priced at $19.99, while two-pod refill packages will be sold for $7.99. 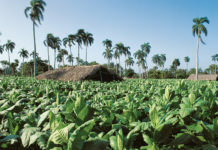 Pods come in eight flavors—Carolina Tobacco, Sweet Tobacco, Menthol, Creamy Mint, Arctic Berry, Apple Strawberry, Watermelon Kiwi and Island Cream—each available in a 4.8 percent, 2.4 percent and 0 percent nicotine strengths. 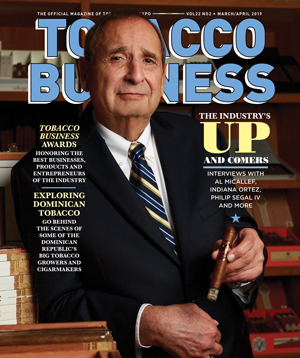 Ultimately, he adds, that’s a key differentiation in an increasingly crowded field of nicotine salt products. “There are other salt-based nicotine salt products out there—the leader and a bunch of other systems have been launched,” he says. “But I would advise retailers to scrutinize not only the product but the company that makes it. I would urge them to choose partners who are committed to the quality of the product—who will, no questions asked, take it back if there is any issue—and who are committed to the FDA process and compliance. These are the things that guarantee retailers who make the commitment to any vapor product that they are doing it with a company that is here for the long term, here to support them, and to not only to drive the business and shoppers to their door but to work on their behalf to support them if there is an issue. That is what makes EAS different.” The bottom line? Many vapers find nicotine salt products more satisfying than those that use pure nicotine, offering more nicotine with less vaping and a smoother throat-hit experience that more closely mimics the combustible cigarette smoking experience.